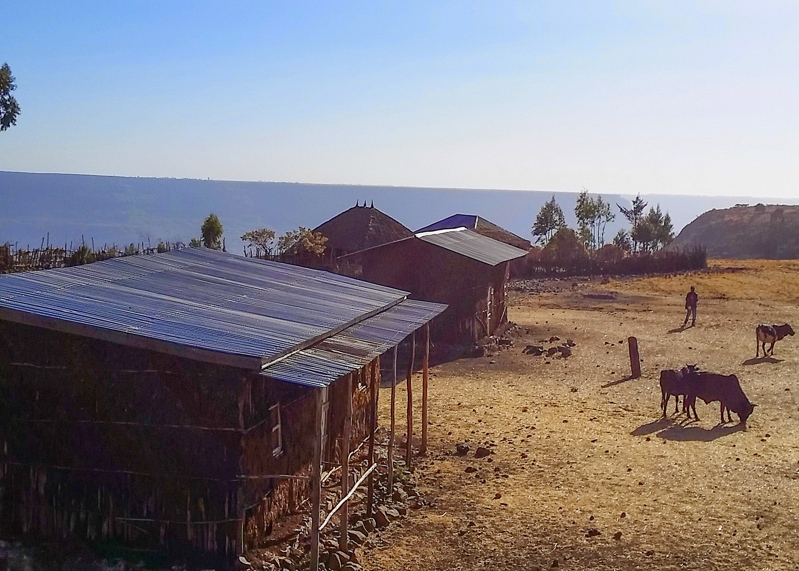 This morning (Sunday) was an early departure at 5 am to begin our way to Tigrey. 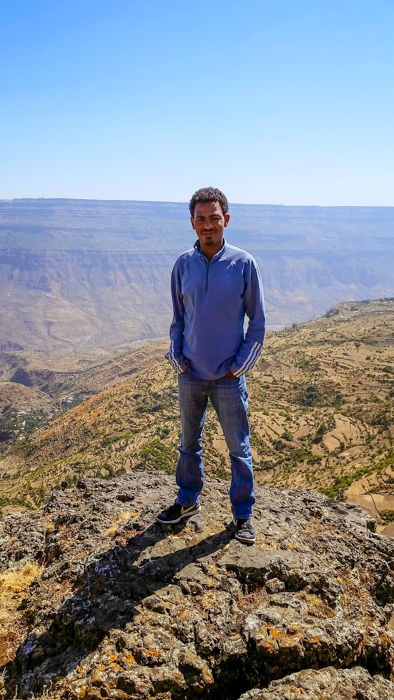 Northern Ethiopia invites a tourist to share 2000 years of ancient monuments from the Pre-Christian Askumite obelisks to medieval Gonder and the rock-hewn churches of Lalibela. We quickly ascended the mountain then entered into a terrain that was agricultural and punctuated by circular churches and circular homes with grass roofs. 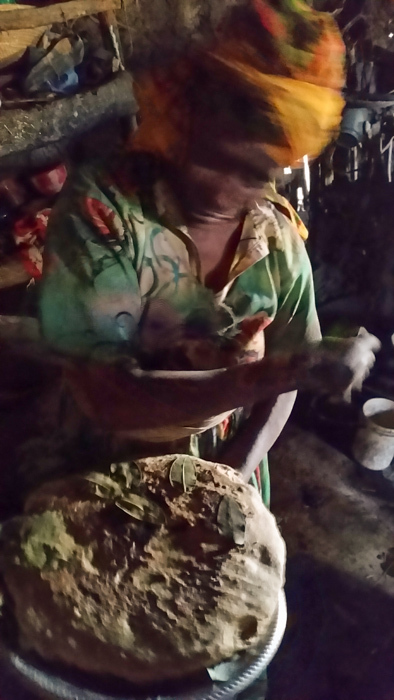 We were invited into the home of a local farming family and immediately the mother of the house had fresh baked bread to offer me. The children were eager to welcome us and all lined up at our jeep to say good bye. 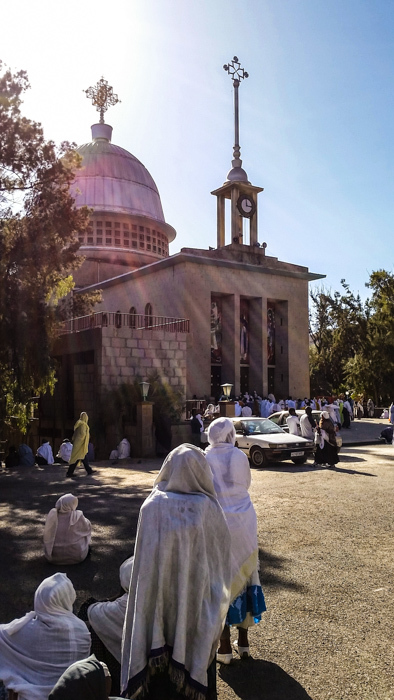 We continued on to Debre Libanos monastery (map of the area) which is one of the holiest sites in Ethiopia. It was founded by Saint Tekla in the 10th century who spread the Gospel in the Highlands and established this monastery in the surronding mountains where hundreds of monks lived in caves. 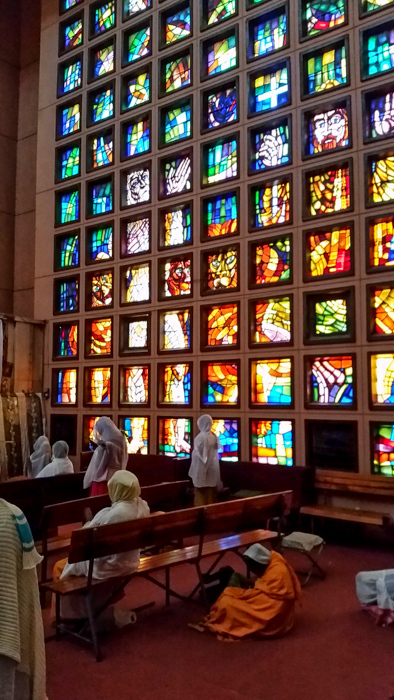 Today there are 350 nuns who live in a convent and about 500 monks who live here as well and some still in caves. On the way I remarked that everything is closed. I guess I was taken by surprise since I have be accustomed to how at home Sunday is no different from any other day. My guide said today is church and family day. We passed many churches with Mass being broadcasted by loudspeakers. People in the church, people in the courtyard, people outside the courtyard, even on the road praying. A spiritual cacophany! As soon as the broadcasted singing would diminish, Mass from another church was increasing in intensity as we approached. Then I noticed groups of 40 to 50 people gathered around the priest on the road instructing people. This so foreign to my experience at home that I was disoriented and puzzled in that people were praying everywhere. 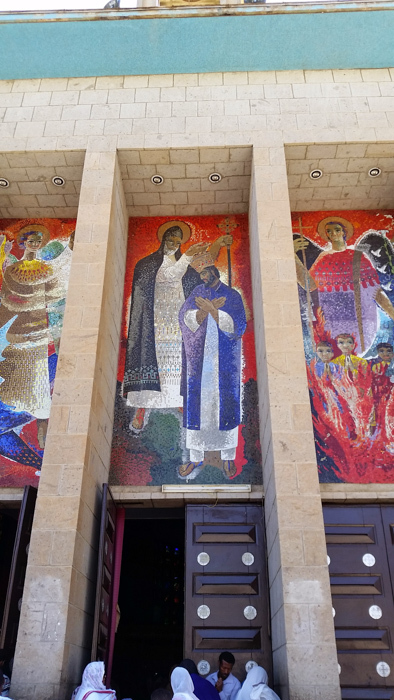 We arrived at Debre Libanos which today is a modern church built by Haile Selassie. The first church was destroyed by the Muslims and the second by fire. 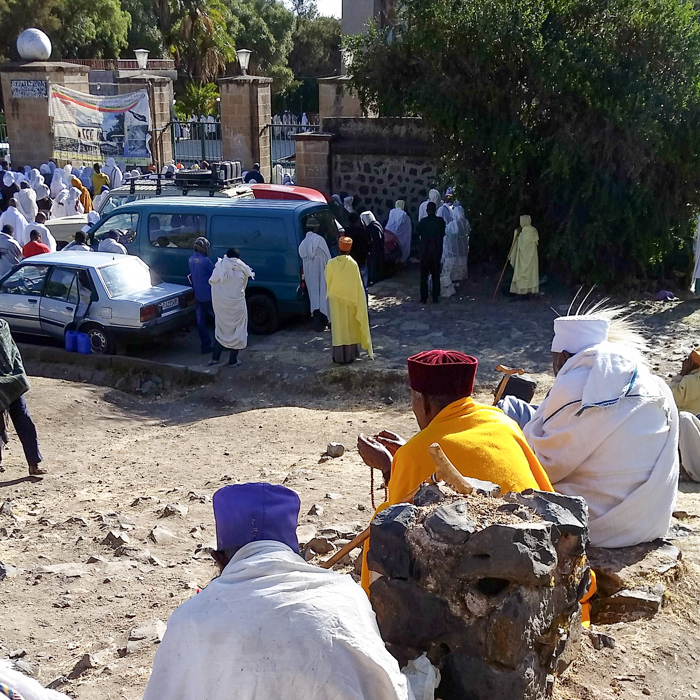 Although disoriented I was intrigued by people praying outside the gate, within the gate while Mass is being broadcasted and holding rosaries and prayerbooks with outstretched hands, foreheads on the ground while chanting responses. After Mass another sermon began as they opened the gate. People were listening, people praying and people prostrate. It was very messy and hard to figure it all out. A monk gave me a tour of the museum which contains ancient manuscripts, imperial crowns and imperial chalices given to the church. The monk’s tour provoked a spiritual conversation as he pointed out artifacts. For example when we saw an icon of Saint George he said that is your patron, the patron of England to which I responded I am not British. Then he pointed to Saint Andrew and said that is your patron to which I responded I am not Scottish. Then he queried: Where are you from? America. And then he said: Who is your patron? I said: Saint Mary. 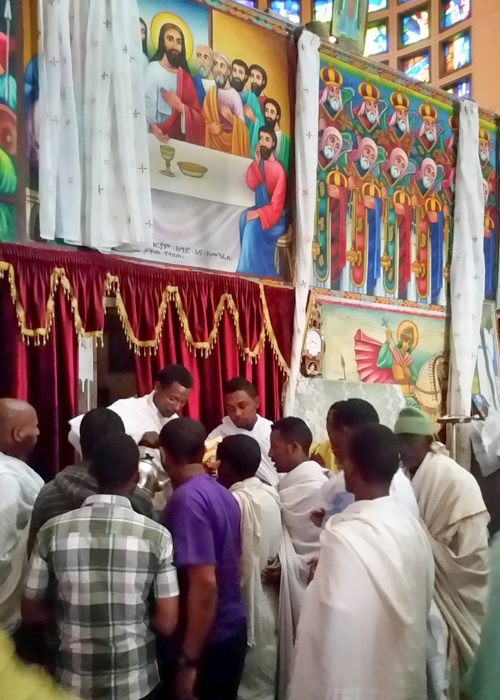 He was elated because the Mother of God is the patron of Ethiopia. The monk was very simple in his faith but profound in that simplicity. When he pointed out the sistrum I told him I celebrated Easter in Jerusalem with the Ethiopians. And I was stunned when everyone ululated. To which he added we ululate when we rejoice. He was delighted that I was in Jerusalem but quickly added “the true Holy Land is the soil of our hearts where Jesus can change our minds and transform our hearts in love.” So simple but profound. When we walked into the courtyard the sermon was concluding with final prayers. This was my opportunity to ask him to clear up for me what I found perplexing. Why do some people pray outside the courtyard and some within with the gates locked and some within the church. The monk said prayers begin at 9 pm on Saturday and continue on through the night and when Mass begins the gates are locked. Those who wish to receive communion go into the church, some choose to be in the courtyard and those who do not feel prepared remain outside the gate. But everyone makes that decision. The priest makes no judgement. If you come to communion or refrain that is between you and God. Everyone knows the discipline but the priests make no judgement. I was quite blunt in my response and said Christianity is on the decline despite that we profess we are a Christian nation. That prompted him to say we have Muslims here and we live in mutual respect and we hope it remains that way. 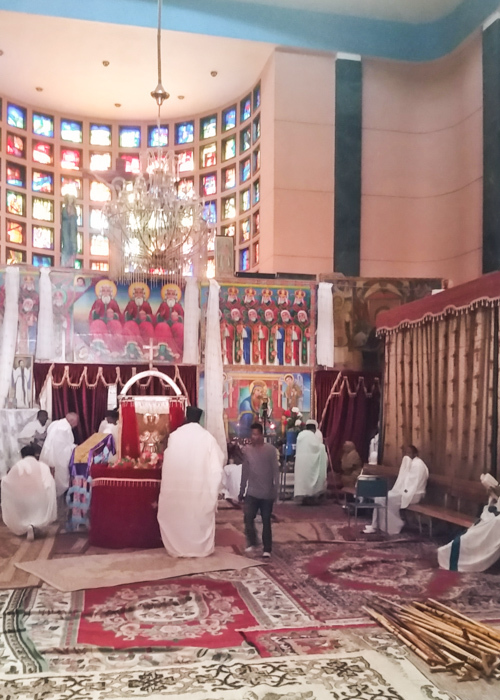 Because of the close Coptic Christian and Ethiopic connection I spoke of my sadness at the recent martyrdom of the Christians on the shores of Libya. He added yes but I rejoice in their courage. Then he pointed to a monument in the middle of the courtyard in memory of the hundreds of priests and deacons and innocent lay people who were slaughtered by the Italians on the order of Graziani who was later imprisoned by the Italians for crimes against humanity. He said we rejoice they are where we want to be: in heaven. The childlike simplicity of the monk evidenced such trust. After the prayers we walked around the church and he pointed out tents and noted that some people come to Debro Libanos and spend all Lent in a tent preparing for Easter. 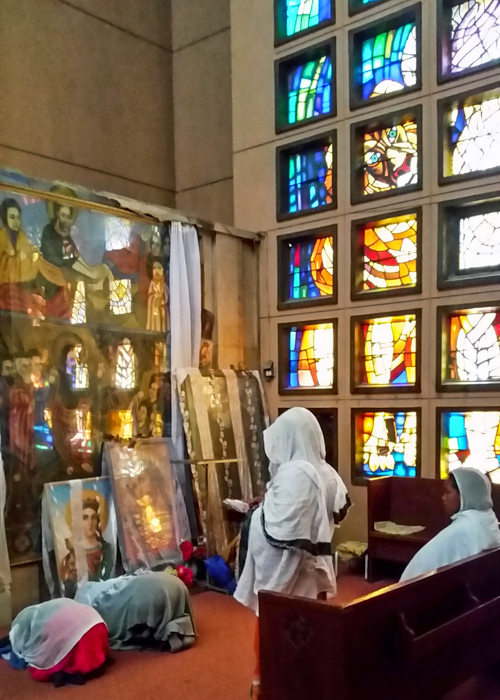 We entered the church and the photos speak of how these Christian people have so captured my imagination. I asked the monk what was the book some people were holding to which he responded: a prayerbook of the Psalms of David. And then asked me do you have prayerbooks in your country. I took out my Android and showed him my prayerbook and he said the Psalms of David in another language but the same Psalms. We had many conversations that made my Sunday a day of rest. What was a tour is becoming a pilgrimage! 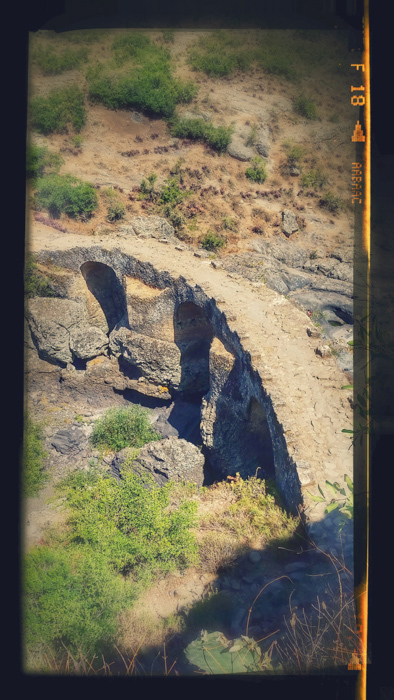 We then continued to the Portuguese Bridge built in the 17th century by the Portuguese who came to help the Ethiopians defend themselves against Islamic aggression and thus they maintained their freedom as a Christian nation. The walk to the bridge was somewhat precarious but a spectacular view. From there we proceeded on to the Blue Nile Gorge. 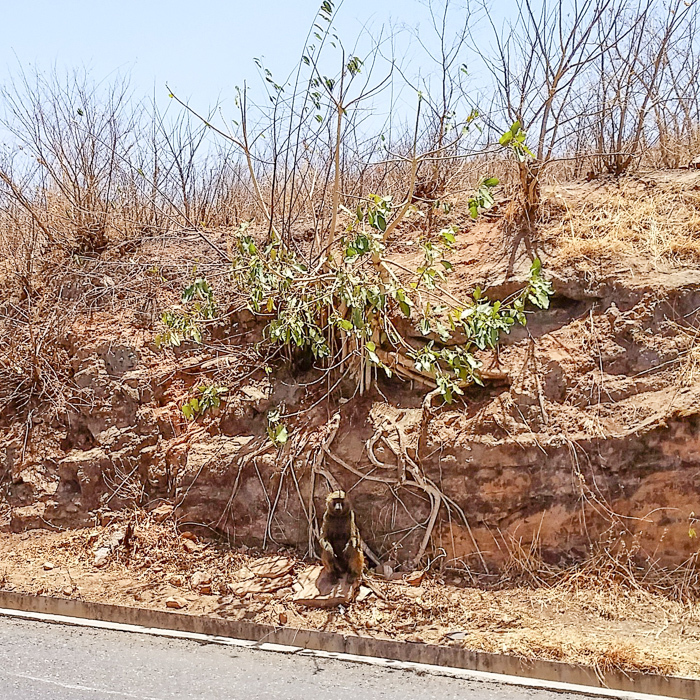 On the serpentine descent to the bottom of the gorge there were multiple sightings of baboons. 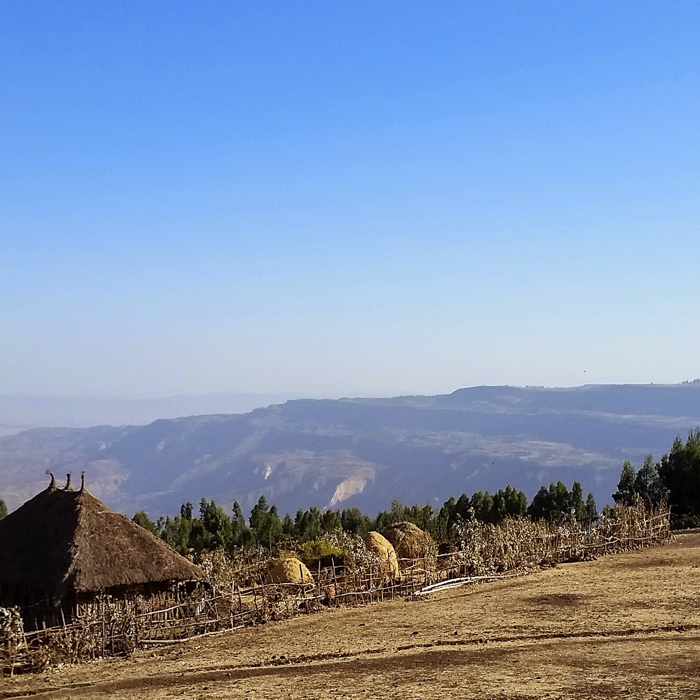 It was spectacular and stimulated my interest to spend a few days in the Simien mountains. 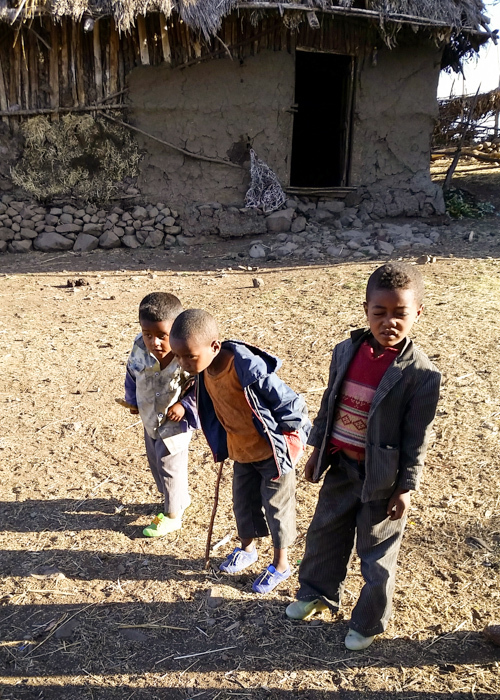 We started very early on this long journey to the historic treasures of northern Ethiopia. However this journey is becoming a pilgrimage. 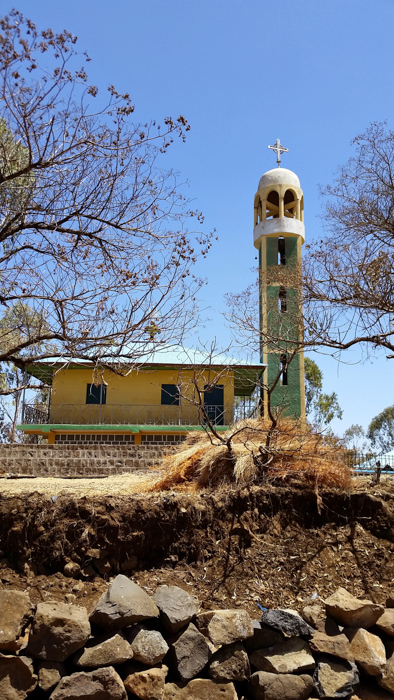 Today was a wonderful prelude to tomorrow trip to medieval Gonder. 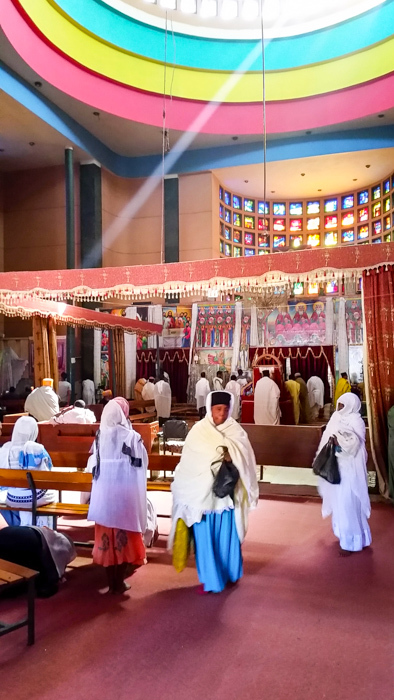 This entry was posted in Faith, Travel and tagged Church, Debre Libanos, Ethiopia, monks, worship on March 16, 2015 by frjfkauffmann.